Our potable fresh water delivery system in the United States is made up of over one million miles of underground pipe, and as I discussed in my last post, it provides individuals like myself with the water needed to survive and enjoy many things we take for granted. Consider, though, that unlike the electrical grid, much of the water delivery system is not interconnected. Water pipe materials are made from steel, plastic, clay, concrete, even wood, and many are at or have surpassed their life expectancy. The average age of the water pipes in Philadelphia are 78 years old, with some pipes having installation dates of 1824. Cast-iron pipes installed in the late 1800s have a useful life span of about 120 years, while the cast-iron pipes installed during WWII have an average lifespan of about 75 years (source). There were wooden pipes still being used in 2009 in Chelan, Wash. Per a 2014 article, on average, every mile of water pipe suffers a break every six years. Due to the age of pipes and mains, water utilities lose 1 out of every 7 gallons of drinking water before it arrives to customers. The American Society of Civil Engineers (ASCE) recently graded several elements of the nation’s infrastructure, and clean drinking water received a “D” grade – again. They estimated there are over 240,000 water main breaks every year wasting over 2 trillion gallons of fresh, treated drinking water. 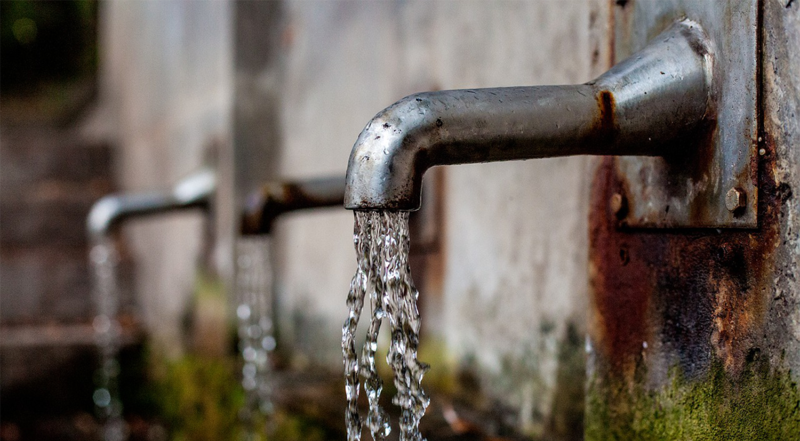 The American Water Works, a publicly traded utility company with operations in the U.S. and Canada, asserts that $1 trillion would be necessary to replace every aging pipe in the coming decades. Unfortunately water infrastructure upgrades are competing for the finite available funds with bridges, roadways, dams and other systems that also require upgrades and replacement. There isn’t a central authority overseeing the entire nation’s water infrastructure. Instead, it is decentralized with 156,000 separate public utility systems. Some systems serve a population base of as few as 500 people. The costs to operate water systems come primarily from user fees and rates. Federal and state grants are available but not in large dollar amounts and most of the grant money that is supplied goes to small and rural areas. Our recent election cycle brought the needs of our nation’s infrastructure to the forefront and Congress is aware of the problem. In 2014 the Water Infrastructure Finance and Innovation Act (WIFIA) passed through Congress and made available $1 billion in loans administered through the Environmental Protection Agency (EPA). Utilities can apply to the EPA for a loan for upgrades and there is also a separate pool of funds for emergency repairs. Another option to finance replacement of aging pipes is the municipal bond process, or the private activity bond (PAB). A PAB is a bond issued by a state or local government for the purpose of financing the project of a private user. Since many cities are experiencing budget difficulties, tough choices are having to be made where cities spend available resources. Utility managers in 99 of 674 midsized cities face significant challenges because their city populations are shrinking leaving them with fewer rate payers and a smaller tax base to collect funds. Internationally the situation is more extreme than in the United States. At the Budapest Water Summit 2016, hosted by the World Bank, representatives from 117 countries attended and admitted that the lack of funding available for water infrastructure has added pressure on these countries to meet Sustainable Development Goal 6. Even though funding the installation, upgrades, and replacement of water delivery systems requires long-term solutions, there are simple things each of us can do today. I’ll ink those in the next posting. Subscribe to our Industry Insights blog to stay updated on the series, along with other construction industry updates, or browse projects to see how we’ve contributed to improvements in water infrastructure. You can also jump back to part 1 here: Amazing Statistics and Insights on Accessible Water.